Church Road runs for 1.6 miles through much of the length of Hartley. It is the ancient highway that took travellers up to All Saints' Church and Hartley Court, the old manor house of Hartley. This article deals with what can be characterised as the "urban" part of the road, as is goes through the centre of Hartley. It is also the only part of the road on mains gas. There is some query as to whether the road has always been called Church Road, as late as 1922 the district council were referring to the road as "Stocks Road", and the developers of the Payne and Trapps estate simply called it "Main Road". It is probable that like Castle Hill, the road had a number of unofficial names until Church Road was finally settled upon. In the past this part of Church Road was much narrower with features such as blind corners to catch out the unwary. 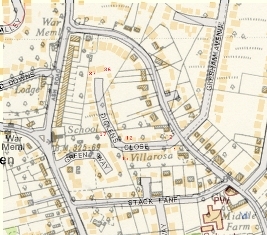 The narrowess of the road can be seen in the map which compares the modern map (colour) with the 1955 map (black and while). The postcard shows the road in about 1920 from Stack Lane to the house called "Villa Rosa", near Dickens Close today. Another postcard by Frith shows the road by the RC Church in 1950, where it suddenly narrows, this was not resolved by the County Council until much later. It was very much a country lane with roadside ponds at the end of Stack Lane and outside Mintmakers, both of which have now been filled in. Increasing urbanisation of the road after the first World War led to more traffic. Dartford Rural District Council classed it as one of their "Grade I" roads in 1926, meaning it had a lot of heavy through traffic. At this time the macadam surface was not tarred, but the following year saw the council authorise it be upgraded to a tarmacadam surface for the first time, it seems this work was completed in 1929. Work was done to mitigate the blind corners in 1933 but even so the council objected (unsuccessfully) in 1934 to the bus service going along Church Road, on the grounds that "Church Road, Hartley, was a narrow carriageway throughout, with many sharp bends, and that the service would be a danger to pedestrians and other traffic." In 1962 Kent County Council decided to widen the road from the Ash Road junction to Stocks Hill and started acquiring the land to do so. It would be 10 years before the works were completed though. The Parish Council objected to the plans in 1966 because they claimed the widening proposed would spoil the rural aspect of Church Road. Nevertheless works began in 1968, but it was not until 1972 that the new junction with Ash Road by the shops was completed. It appears there was talk of traffic lights, but Hartley did not want them, and a mini-roundabout was too expensive for the County Councll to consider. Originally Church Road was just subject to the national speed limit. Dartford RDC recommended a 30mph speed limit in 1934, but it was not until 1974 that this became a reality on this section of the road (London Gazette 1.2.1974). 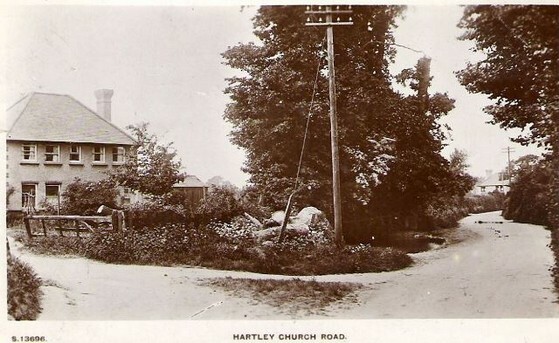 It is noticable that many of Hartley's ancient farms are in Church Road and also that they have land on both sides of the road. This section of Church Road has Woodins, Middle Farm and Blue House Farm (Mintmakers), all of which existed before 1600. A report of lands owned by Hartley Court in 1392 suggests that there were once two open fields - Northfield and The Rede, whicb were divided by Church Road, which may explain why so many farms have land on both sides of the road. But it is important to realise it is just a theory, while open fields did exist in Kent, they are not thought to be the same as those in the Midlands where farms owned intermingled strips. (2) Planning Application 2018 (GRANTED) 2018/1507 Demolition of existing garage/utility to facilitate the erection of a double storey side extension, front extension and elevational changes. (2) Planning Application 2011 (REFUSED) 2011/3206 Conversion of integral garage living accommodation and the construction of a detached garage with home office within roof space. (2) Planning Application 2012 (REFUSED) 2012/606 Conversion of integral garage living accommodation and the construction of a double detached garage to the front of the property. (2) Planning Application 2013 (REFUSED) 2013/442 Erection of a double garage in the front garden, and the conversion of the existing integral garage into living accommodation. (2) Planning Application 2014 (GRANTED) 2014/3429 Conversion of existing integral garage into domestic accommodation, and formation of two car parking spaces. (2) Planning Application 2015 (GRANTED) 2015/898 The erection of a single domestic garage. (2) Planning Application 2017 (GRANTED) 2017/4061 Minor material amendment to application SE/17/0845/FUL for the erection of a detached house with integral garage and associated parking to show reconfiguration of the roof on the rear and side elevations. (2) Planning Application 2018 (GRANTED) 2018/17 Details pursuant to condition 2 (materials) of SE/17/02845/FUL. (2) Planning Application 2018 (GRANTED) 2018/1012 Details pursuant to condition 5 (electric vehicle charging point) of planning permission SE/17/04061/MMA. (2) Planning Application 2018 (GRANTED) 2018/955 Details pursuant to condition 3 (hard & soft landscaping) of planning permission SE/17/04061/MMA. (2) Planning Application 2018 (GRANTED) 2018/1011 Details pursuant to condition 4 (boundary treatment) of planning permission SE/17/04061/MMA. (2) Planning Application 2018 (GRANTED) 2018/1013 Details pursuant to condition 6 (ecological enhancements) of planning permission SE/17/04061/MMA. (2) Planning Application 2017 (GRANTED) 2017/114 Outbuilding erected within the domestic curtilage. (2) Planning Application 2017 (GRANTED) 2017/177 Alteration to windows in the ground floor of front elevation. (2) Planning Application 2018 (GRANTED) 2018/1209 Proposed first floor extension to the front south east elevation and porch canopy underneath on ground floor. (2) Planning Application 2018 (WITHDRAWN) 2018/372 Proposed first floor extension to the front south east elevation and new dormer window to the rear north west elevation. (2) Planning Application 2015 (GRANTED) 2015/1376 Erection of single storey side extension with chimney to flank elevation. (2) Planning Application 2016 (GRANTED) 2016/2554 Demolition of existing dwelling and erection of 2no. 4-bedroom detached houses each with detached garage, formation of new access. (2) Planning Application 2009 (GRANTED) 2009/1424 Demolition of existing dwelling and erection of a detached chalet bungalow and a detached bungalow with alterations to the vehicular access. (2) Planning Application 2007 (GRANTED) 2007/3704 Nine velux windows. (2) Planning Application 1965 (GRANTED) 1965/452 Change of use of part from ladies hairdressing to office. (2) Planning Application 2014 (GRANTED) 2014/3251 Demolition of existing dwelling and garage, and erection of two four bedroom detached dwellings and one three bedroom bungalow with associated revised access to Church Road. (2) Planning Application 2016 (GRANTED) 2016/730 Details pursuant to condition 3 (proposed slab levels) of SE/15/03264/FUL. (2) Planning Application 2018 (GRANTED) 2018/858 Demolition of existing bungalow, garage and shed and erection of 2 detached houses. (2) Planning Application 2016 (GRANTED) 2016/2144 Demolition of existing shed. Raising the ridge height and gable ends to incorporate a first floor extension with rear dormer, side dormer with two roof lights and front dormer. Erection of a single storey side extension. Alterations to fenestration including a canopy roof to rear and existing chimney stack raised, internal alterations and the construction of a new driveway. (2) Planning Application 2016 (REFUSED) 2016/767 Demolition of an existing bedroom and entrance lobby. Erection of a ground floor extension with a part upper storey. Construction of an additional driveway. (2) Planning Application 2009 (GRANTED) 2009/1381 Demolition of existing dwelling. Erection of two detached 4-bed dwellings with integral garages, access and parking spaces. Revised application incorporating minor amendments following approval of SE/09/00192/FUL. (2) Planning Application 1962 (GRANTED) 1962/68 SEEBOARD - Formation of access to proposed substation. (2) Planning Application 2015 (GRANTED) 2015/1207 Details pursuant to condition 2 (materials) of SE/14/02377/LBCALT. (2) Planning Application 2015 (GRANTED) 2015/1208 Details pursuant to condition 3 (doors & windows) of SE/14/02377/LBCALT. (2) Planning Application 2015 (GRANTED) 2015/1209 Details pursuant to condition 4 (restoration and method statement) of SE/14/02377/LBCALT. (2) Planning Application 2015 (GRANTED) 2015/1210 Details pursuant to condition 2 (materials) of SE/14/02376/FUL. (2) Planning Application 2015 (GRANTED) 2015/1211 Details pursuant to condition 3 (doors and windows) of SE/14/02376/FUL. (2) Planning Application 2015 (GRANTED) 2015/1212 Details pursuant to condition 4 (restoration and method statement) of SE/14/02376/FUL. (2) Planning Application 2015 (GRANTED) 2015/1213 Details pursuant to condition 5 (soft and hard landscaping) of SE/14/02376/FUL. (2) Planning Application 2015 (GRANTED) 2015/1215 Details pursuant to condition 8 (biodiversity) of SE/14/02376/FUL. (2) Planning Application 2015 (GRANTED) 2015/1216 Details pursuant to condition 17 (construction method statement) of SE/14/02376/FUL. (2) Planning Application 2015 (GRANTED) 2015/1214 Details pursuant to condition 7 part i (code for sustainable homes) of SE/14/02376/FUL.